Rockt Punch - Strawberry Shortcake Stunner 120mLA fresh and fluffy cake topped with juicy and sweet ..
Rockt Punch - Rainbow Riot Squad 120mLRainbow Riot Squad by Rockt Punch delivers a delicious rainbow..
Rockt Punch - Melon Milk Crusher 120mLA must try e-juice that transforms southeast Asian honeydew wi..
Rockt Punch - Ultra Magnetic Fruit Loop 120mLNot your typical cereal flavored e-liquid. 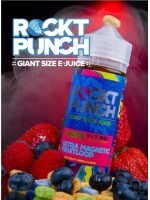 Ultra Magnet..
Rockt Punch - Island Ice Cannon 120mLYou've never had an e-juice like this. With a variety of island..
Rockt Punch - Blue RZA Thunderbomb 120mLBlue RZA Thunderbomb - a refreshing blue raspberry icy slush..